We had a pretty exciting weekend at our house. After searching for about two years, I finally found a vintage travel trailer for our family. I had found many trailers over the last two years, but it was exceedingly difficult to find one that fit my needs (small, easy to tow) and one that fit my husband's (enough beds for a family of 5, not a complete wreck). 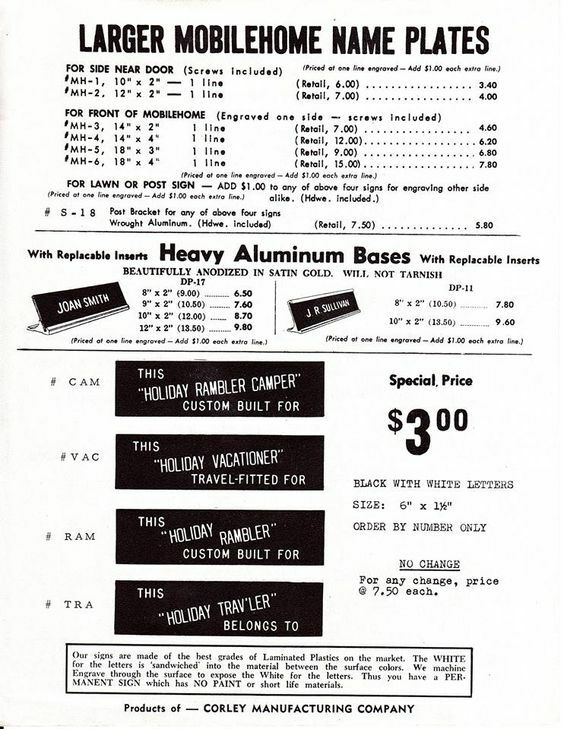 I had been looking specifically for a Holiday Rambler. I had done a bit of research, joined a owners group and thought that was really what I was looking for. Two came up during my search but they were both quite far away and were around 23 feet (too big for me). Just a note about my search (for those who are also looking). I set up a Craigslist search as a bookmark on my phone and looked at the most recent listings within so many miles every single day. (Yes...2 years of looking every day). I also set up a custom search on eBay and organized my results by distance. I did have some local trailers come up on eBay so it was worth having the alert set up. I finally found a vintage trailer on Craigslist a few weeks ago. It was a pretty perfect solution. Since it was a cab-over model, it had two bunks, a gaucho bed, and room for a dinette bed. Cab-overs are a bit more rare, and I think they have a bit of a cool factor as a result. The seller had taken the trailer down to studs and repaired any damage (the real killer of a vintage trailer is water). I hesitated because it was over three hours away, and the seller didn't know what brand trailer it was. (I had guessed by searching on Google it was a Yellowstone) The idea of driving three hours without much idea of the condition of the trailer or if it would even make the trip back made me sit on my hands for a couple of weeks. I decided to at least email the seller just to see what he had to say about the condition. That really ended up being the reason I decided to purchase it. He was very forthcoming about what work had been done and needed to be done. He took it somewhere local and had the tires looked at and the wheel bearings repacked. So, on Saturday afternoon we dropped the kids off at grandma and grandpa's, and headed north. Since I thought I was purchasing a Yellowstone, I left the Holiday owners group I had been stalking for two years and decided to give up on that part of my dream. Once we got to the trailer (three hours of loud country music singing later..ahem husband), we started to look over the trailer. There were problems here and there. Two windows had been removed (which I knew had happened), but the remaining original ones were caked in silicon caulk (NEVER USE THIS ON VINTAGE TRAILERS!!!) and expanding foam (both fixable but a HUGE pain to deal with). The finishing work wasn't terribly great, and I wasn't a fan of the ceiling material. But in reality, those were very small things. One huge surprise and almost made me jump up and down with excitement was a little painted over sign on the outside. To my surprise, this trailer was a Holiday Rambler. I felt like an idiot for not realizing it sooner. It was missing the trademark quilted design (a design that apparently made it's depute a few years later), so I didn't even think to check. 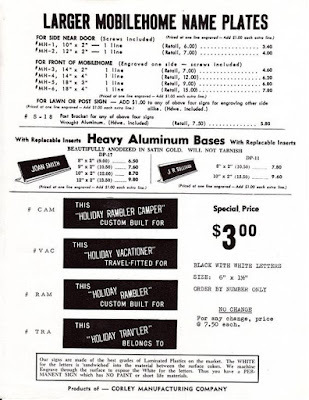 The original advertisement for the custom name plates. So, I decided I would try to adjust the price to deal with those various issues (which worked), and we hooked up the trailer and set off home. I spent the entire trip with my fingers crossed that the trailer wouldn't just fall apart during the three hour trip. Every time we went down a hill, my stomach dropped that I would see the trailer cruising beside our truck. She towed beautifully. The size ended up being just right. We pulled in at around 8 pm tired, but happy with our purchase. Yesterday I decided to take a closer look. After speaking with my husband (and mostly to myself), I decided that our renovation will be a two stage project. Since the trailer doesn't leak right now and tows perfectly fine, I'm going to tackle cosmetic things this spring. That includes a bit of paint, new foam and cushion covers, flooring and building a dinette back into the floor plan. After the camping season this year, we're going to try to do some of the tougher stuff over the winter. My husband wants to remove the new paneling to put it back on a bit more finished. If he's going to remove that, I'm going to tackle the windows and attempt to find replacements for the two large windows that were completely removed. I rejoined the Holiday owners group and already have a lead on some original 1963 window replacements. I'll also tackle the foamed up windows. We'll do a once over on the wiring to make sure it's still in good shape (the previous owner did have that looked over, but I'd like to look again). I want to remove the toilet and furnace (Both are original, but useless to us. I may as well get some more closet space in the process). I also want to reseal the roof and install a new ceiling fan/vent. The door needs to be completely rebuilt. The last step will be a new paint job on the outside. My husband wants to keep the blue, but I kinda want to go aqua (it is my favorite color after all). However, I had a 1972 bug that this project is replacing, and ol' Dum Dum was baby blue as well. Maybe it's fate she remain that way. The final surprise our '63 had for us was a envelope of paperwork. I didn't notice it until yesterday, but the trailer came with every single piece of original paperwork for the trailer. I have manuals for every appliance in the trailer (regardless if it's still there) and all the original advertisements and information for the trailer itself. It has been really cool going through the paperwork and seeing the notes from the very first owner. I've already had request from fellow 63 owners to upload it into the owners group I'm part of. I'm not going to go completely original. So much of the original cabinets and appliances have been removed, that I know it's not going to be a full restoration. So it's going to be part restoration and part glamper-ation. My husband and I still arguing about what to name her. I keep coming back to something Wizard of Oz themed which just makes my husband roll his eyes. We shall see what kind of name she takes on. I already have found my membership with Tin Can Tourist and Ramble On Club invaluable for tutorials and pictures of original trailers. The community of vintage trailers is extremely welcoming, and I'm hoping I can make some events once we get her fixed up. I look forward to sharing the work of our little vintage trailer on my blog! Ugly House projects are winding down (for now), so this will be a fun project on the side. Not to mention I'm a huge advocate of families camping. The kids have already asked to sleep in her even though it's about 30 degrees out right now. Paint job is fairly new (and DIY upclose). It's missing a couple extra lines of paint, but it's pretty close to the original design. The awning rail is still there, and I plan on getting a vintage recreation made. The previous owner removed the large back window and the large front window (to add air). We're going to put those back in eventually if I can find recreations or original replacements. All lights on the outside work. Bunk windows are packed full of expanding foam. I will be pulling these windows this summer and replacing the glass on the one broken one. A good cleaning and new seals should make them good as new. We aren't exactly sure what we're going to do here. We're thinking we want to keep the A/C for convenience sake, but we also really like the original windows. We have to do something with that spare tire set up. The old windows were replaced with these new sliding windows. I don't know if we'll keep these. The original ones were much larger. Small dents here and there from hail. We probably aren't going to get too worked up about that. The door needs some TLC. I found instructions online on how to rebuild the door from scratch so I think that will be our fix this winter. The interior is in fairly good shape after the previous owner replaced all the paneling and reconfigured the interior. We need to do some finishing work, but it will work nicely for this year. Front bunk. Not a fan of the plastic like paneling used on the ceiling. Once we're sure we're water tight, we'll be replacing with a wood paneling. Kitchen area. The fridge and stove were removed, but I think we'll just replace the fridge. We do most of our camping cooking over an open fire (pie iron!!!) or on a propane stove. Original door and furnace. We don't want to hook propane up to the trailer, so I'll be removing the furnace. An electric heater will do the trick if we really need it (although we don't camp in very cool temps). The door leads to the worlds smallest bathroom. We'll be removing the original toilet and just add a closet into the room. We'll be restoring the original foot print in this area to include a folding down dinette set. The table is the original table to the trailer. The ladder will work for now, but we're going to be building a replica of the original. The original actually hooked into the side of the bed to be a guard rail for the top bunk. I just bought a bunker - we are not sure the year but looks very much like your. We have an extra window in the back though. SO hard to find any info on these old gals. Any way I can get the data on the brochure you had in yours? Is there a place online where I can view it? Just trying to learn more about mine. Thanks! Ours is all original paneling, oven, etc. I think maybe a rare 19xl with the duplex bunk? I haven’t seen any info nor pics on line if one like it. But yours is very similar in body. We just joined the holiday rambler site so hoping to learn more there!